About "Dividing polynomials with missing terms"
Here we are going see how to divide polynomials with missing terms. When we want to divide a given polynomial by another polynomial, first we have to write the dividend inside the long division sign from highest degree to lowest degree. For example, the highest degree of the polynomial is 3, then the next term of the dividend must be the square term and so on. In this, if we don't have square term, we have to write 0 instead of this and we can write the next terms. The degree of the given polynomial is 3 then we must have square term. But here we don't have square term, so we have to replace it by 0. 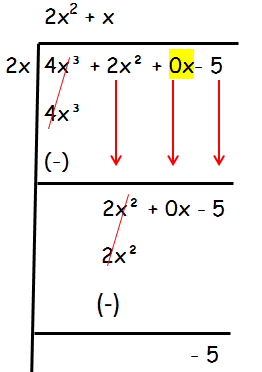 In the first step, we have to divide the first term of the dividend by the first term of the divisor. If we divide a³ by a, we will get a².We have to write a² at the top and multiply each term of the dividend by a². By subtracting a³ - 2a² from (a³ + 8a - 24), we get 2a² + 8a + 24. 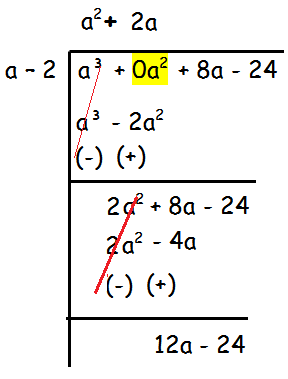 Now we have to divide 2a² by a, so we will get 2a. 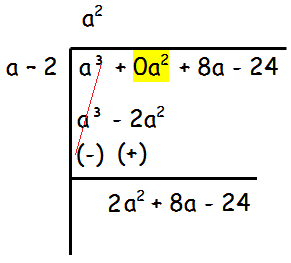 By multiplying this 2a by (a - 2), we get 2a² - 4a. Divide 12a by a, so we get 12. 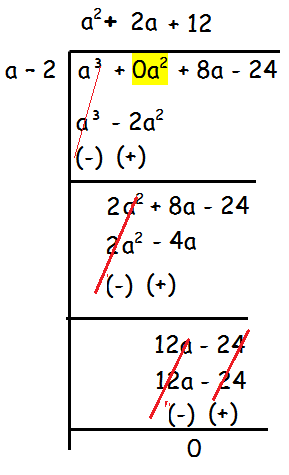 By multiplying this 12 by (a - 2), we get 12a - 24. By subtracting 12a - 24 from 12a - 24, we get 0. The degree of the given polynomial is 3. But here we don't have x term, so we have to replace it by 0. If we divide 4x³ by 2x, we will get 2x². Write this 2x² at the top. Multiply 2x² by 2x. So we get 4x³. Subtract 4x³ from 4x³ + 2x². 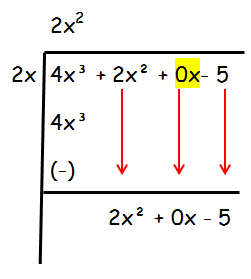 Now we have to divide the first term of the dividend 2x² by 2x, so we get x. By multiplying x by 2x, we get 2x². After having gone through the stuff given above, we hope that the students would have understood "Dividing polynomials with missing terms". Apart from the stuff given on "Dividing polynomials with missing terms", if you need any other stuff in math, please use our google custom search here.